You don’t need me to tell you that gravel and adventure bikes are hot stuff right now, with more manufacturers rushing to launch new bikes all the time, and what actually constitutes a gravel and adventure bike evolving constantly. Here then are 10 of the hottest new gravel bikes you need to know about from Cannondale’s Topstone to the stainless steel beauty from Condor Cycles. Read more: Is a gravel/adventure bike all you need? If you prefer skinny slick tyres, be sure to check out the 10 hottest road bikes of 2019. US brand Cannondale has entered the gravel bike market properly now with the new Topstone, a range of aluminium bikes packed with all the details we’d expect on a bike designed to be able to do everything from a bikepacking weekend to daily commuting duties. Cannondale has used its considerable expertise in shaping aluminium to produce a smart frame with space for 42mm tyres on 700c wheels, but you can run 650b if you prefer. There is internal routing and provision for a dropper post, plus rack and mudguard mounts. The Levarg (gravel backwards) is a new aluminium gravel and adventure bike available in three builds priced from £1,100 to £2,300. The high price of the top-end model is due to the fitment of the Fox AX suspension fork and a dropper post, two components that help to blur the lines between a road and mountain bike. The three models in the range use the same custom butted 6061 aluminium frame with a 142x12mm rear dropout and a full carbon fibre fork with a tapered steerer tube. The down tube is curved at the head tube to ensure clearance with the suspension fork crown, and there are additional bottle cage mounts and internal routing for gear cables and brake hoses. The new G2 builds on the success of the company’s ATR and AT gravel bikes with a more affordable package, it costs £1,500 with an SRAM Apex groupset and that includes hydraulic disc brakes and a wide range cassette. This is the second-generation gravel bike from the mountain bike company brought to you by Chain Reaction Cycles, and it’s got a lot of crossover design and tech from mountain bikes. The aluminium frame is adorned with 650b wheels and 47mm wide tyres, a 120mm dropper post for tackling steep descents without squashing your bits and all the versatility you want for everything from commuting, road riding and off-road adventures. Another mountain bike company that is bringing its off-road experience into a multi-surface go-anywhere gravel bike. The second-generation Gestalt rolls on 700x42mm tyres but it’ll take 650b if that floats your boat and the frame has some trick details such as the internal routing for the dropper post, which is cleverly activated by the left-hand SRAM brake lever. A Rival 1 groupset gives you a wide range of gear ratios for tackling chunky terrain and the hydraulic disc brakes keep you out of trouble at high speed. British company Fairlight Cycles has entered the growing gravel and adventure bike market with its Secan. It’s loosely based on the more road-focused Strael but the steel frame and new carbon fork have space for 650 x 57mm or 700 x 47mm wheels and tyres. The Secan is built from a Reynolds 853 custom tubeset, like the Strael, but with a few key changes. A close relationship with Reynolds allowed Fairlight to develop a Dual Zone Butting (DZB) down tube that meets the specific requirements for this frame. More material reinforcing the down tube at the head tube avoids the need for a gusset, and it passes tough ISO (International Organization for Standardisation) tests. Following on from the Bokeh with an eye on even bigger terrain and adventures, the new Mason InSearchOf is a big-tyred aluminium gravel bike that has a lot of mountain bike influence in its design, yet it stays this side of the road/gravel bike divide. A custom Dedacciai Zero steel frame has been developed with a swoopy downtube to provide clearance for a suspension fork, while the top tube is also curved to provide extra frame bag clearance. There’s all manner of mounts for racks, mudguards, a dynamo light and internal routing for both 1x and 2x groupsets. The frame is accepting of both 29x2.4in and 27.5x2.8in mountain bike tyres. 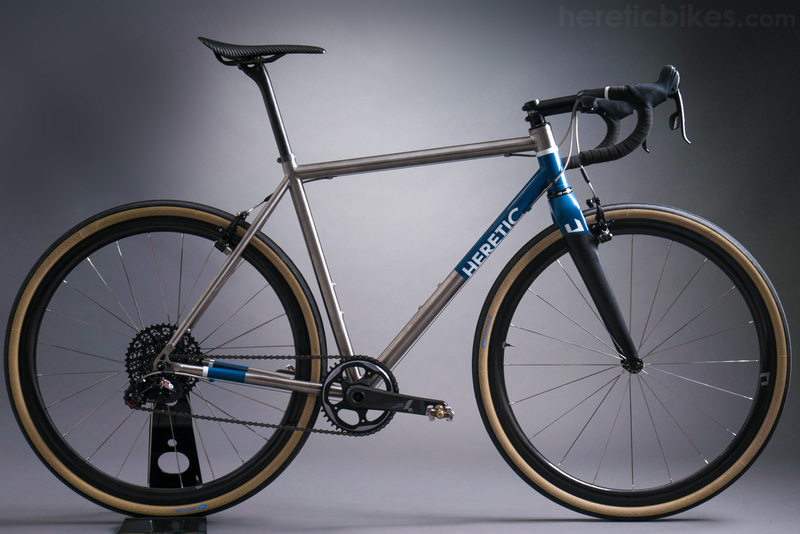 London-based Pearson Cycles has lined up this good-looking aluminium gravel bike with some good details that look to make it ideal for a spot of off-road riding plus commuting and touring. It has clearance for a whopping 46mm tyre and there are a full complement of rack and mudguard mounts and a carbon fibre fork with 12mm thru-axle and flat mount disc brake. “The aim of this bike was to be able to adapt to different disciplines of cycling without compromise in performance, versatility is the name of the game,” explains the company. British company Forme may not be the most well-known of bike brands but its new Monsal Rival is sure to elevate its profile, especially among those people wanting a really nicely designed and good value gravel bike. You get a smart full carbon frame, with a dropped chainstay to improve clearance, with disc brakes and thru-axles and space for up to 45mm tyres. This model pictured features a full SRAM Force 1 groupset with Mavic Aksium wheels and Kenda 35mm tyres. London's Condor Cycles used the Cycle Show to launch its lovely new Stainless Gravel Disc bike. It uses the same Columbus XCr stainless steel front triangle as its Super Acciaio road bike, but with a new rear triangle to provide clearance for up to 40mm tyres, combined with a Columbus carbon fork, 12mm thru-axles and flat mount brakes. The Condor looks wonderful....but over £3500 for frameset only? Seriously? I'm sure the Condor is lovely and well, heritage and all that stuff, but Bowman will build you a custom stainless frameset for half that price. Including custom paint and they specialise in the sort of finish the Condor has. To be fair, on their site it does say 'full custom geometry' and the finish looks impeccable + one shouldn't beat it before having tried it. Still, a bit rich for my blood. For steel afficionados perhaps. That amount of cash buys an excellently appointed carbon gravel bike. That Heretic looks amazing. I really like the German/Austrian approach to fitting out touring bikes - a big part of my decision to buy my Faran was following a build thread on rennrad. All just so and very neat and understated. Wow, what a collection of rubbish and childish names! Surprised that the Ribble CGR doesn't make an appearance, I'm very tempted by one right now.